Capt. 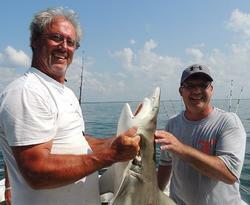 Ronnie Atkinson, owner and operator of Fish Hook Charters, is a licensed master captain. He has been fishing in the Atlantic Ocean from the age of 10. He purchased his first offshore fishing boat in his high school days. Captain Ronnie has numerous safe time hours commercial fishing and running charter boats, dive salvage boats, and sportfishing boats from New Jersey to south Florida. As owner of the Fish Hook Charters company, he strives to make your trip a fun, family-friendly experience. Capt. Graig A France has been a licensed Master Captain for 25 years. He was born and raised in the Murrells inlet area where he grew to love the ocean. From a young age, he has worked on commercial fishing boats and charter boats. He has also captained numerous head boats and charter boats, as well as large crew boats in the Gulf Of Mexico for oil companies. Many years of experience have led him to be a productive fisherman and to have many safe passages on the open seas.